This is awesome news for people that are looking for some awesome games at reasonable prices. 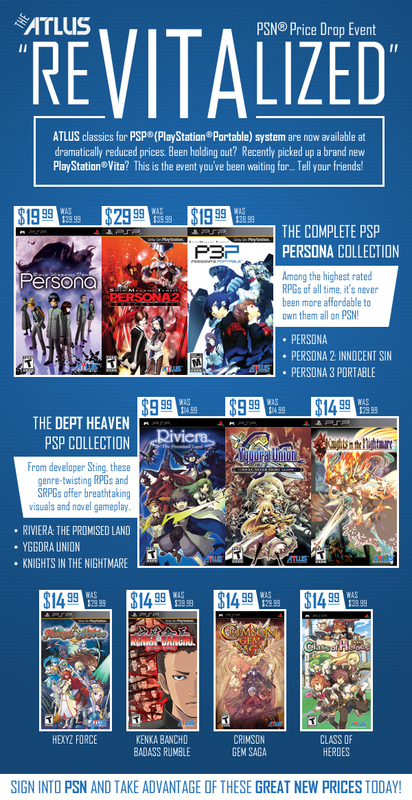 Kudos to Atlus for taking this initiative to offer older titles at a deep discount. I, for one, will be purchasing quite a few of these titles now and I hope Atlus’ sales surge enough that they can make a case to do these types of events more often and, hopefully, convince other companies to follow suit. Even though Android and iOS offer less of a core gameplay experience, the prices for games on these platforms far outweigh the overall quality on these platforms. The result is such that people now expect much lower prices then what is currently showing on the PSN store for the PS Vita.